After I threw away my make-up, stopped wearing foundation, and introduced some outstanding beauty products, I feel I’ve hit my stride with my beauty routine. I have a simple regime using minimal products, which achieves excellent results proving less really is more. My skin has the best it ever has been. 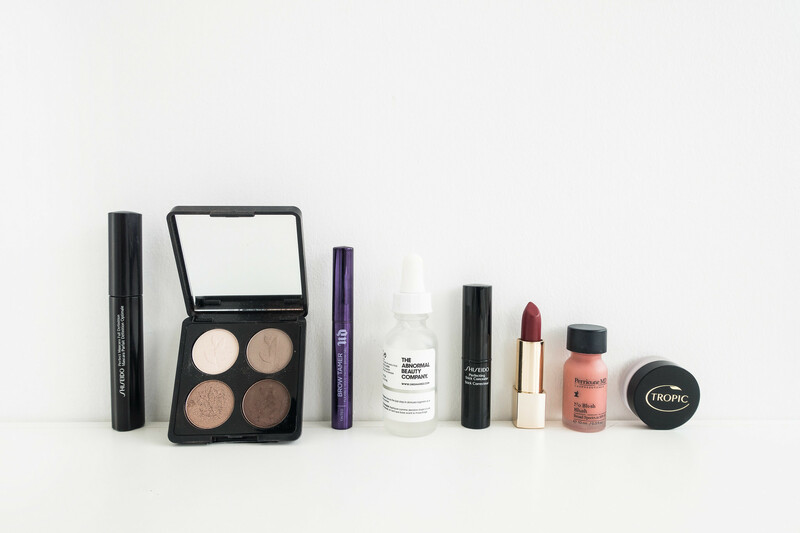 It’s been a while since I shared a breakdown of my beauty routine so let’s get stuck in. My morning routine is super simple, I wash my face in warm water, moisturise, apply sunscreen and I’m done. I no longer cleanse in the morning or apply any kind of treatments. Moisturiser and sun protection is enough for me. To protect my skin I apply Tropic Skincare Skin Shade Mineral Sun Protection. What I love about this product is it’s tinted, which means no white cast. It blends seamlessly into your skin; there’s no residue or stickiness, it sinks right in and feels lightweight. The tint doesn’t alter your complexion, it just prevents the white cast stereotypical of sunscreen. Unfortunately Tropic are removing the tint from this product due to staining, which is a shame because I have yet to find sun protection I enjoy using more. 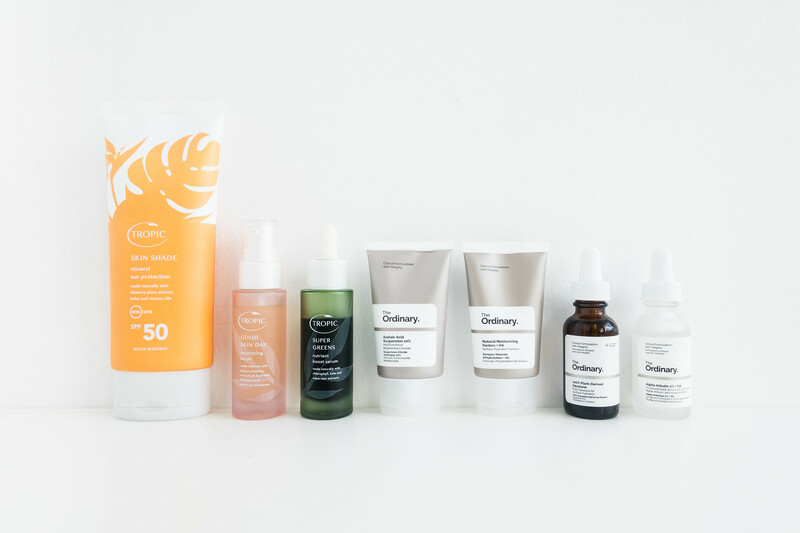 I’ve been trialling The Ordinary Natural Moisturising Factors + HA for surface hydration; the formula is designed to keep the outer layer of the skin protected and well-hydrated. It has a creamy, non-greasy texture that’s lightweight and easily absorbed. It feels gloriously soothing on the skin and I wake up with a plump, hydrated complexion. Previously I had been using the Grown Alchemist Hydra-Repair Day Cream, a thick, nourishing moisturiser that’s non-greasy. Both moisturisers prep my skin perfectly before make-up application and, because I don’t wear foundation, it plumps up my skin and lets my natural complexion shine through. In the evenings I double cleanse and treat my skin for any troubles it may be having, which isn’t often anymore. After cleansing I apply a moisturising serum, Tropic Skincare Super Greens Nutrient Boost Serum, which is packed with natural extracts, oils, and vitamins to calm skin irritations, redness, and accelerate skin repair. It’s lightweight, fast absorbing, and I wake up in the morning with a refreshed complexion. It’s one of those products I simply couldn’t be without anymore. If I need to treat my skin it’s usually down to a few reasons: dehydrated and dry skin, a dull complexion or rogue blemishes. To kickstart treatment I reach for Tropic Skincare Good Skin Day Resurfacing Serum. It’s a restorative serum that resurfaces the top layer of skin. The formula uses fruit enzymes and complexes to exfoliate, tighten, and refine. I follow this up with a deep cleansing mask, nothing specific although usually clay based to draw out impurities. This preps my skin for treatment specifically targeting troublesome areas. If my skin is dehydrated I’ll use The Ordinary 100% Plant-Derive Squalene and if my complexion is looking dull I’ll apply The Ordinary Azelaic Acid Suspension 10%. 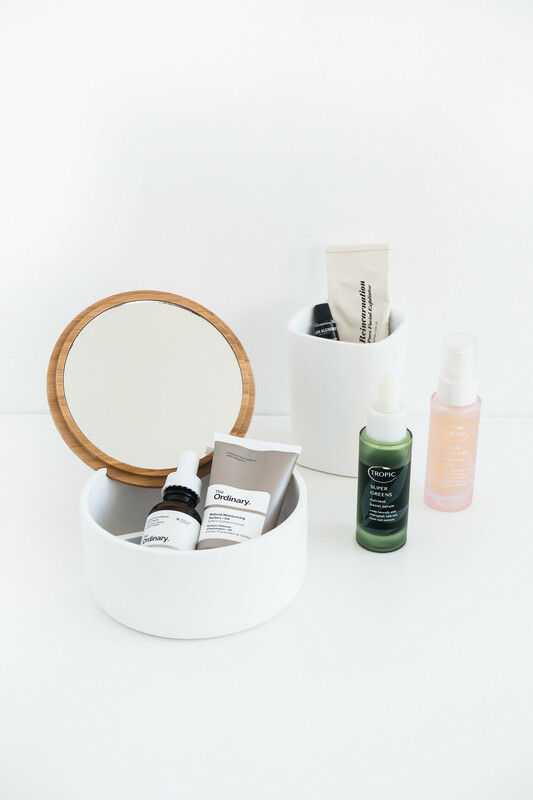 The Ordinary uses 100% pure plant-derived Squalene; a saturated and stable hydrocarbon, which aids hydration. It feels slippery and cooling on the skin and it absorbs quickly. The high emollience means the formula softens, relaxes, and soothes the skin. Within one or two applications I noticed a distinct improvement and paired with The Ordinary Natural Moisturising Factors + HA, it’s a great combination to rehydrate and restore your complexion. To tackle blemishes and hyper-pigmentation I treat with The Ordinary Alpha Arbutin 2% + HA. The concentrated formula contains purified alpha arbutus and hyaluronic acid; the potent blend targets marks, scars, hyper-pigmentation, and dark spots by inhibiting melanin production. As I’ve gotten older, I’ve noticed the few blemishes I have result in small marks which are taking longer to diminish and disappear. Using Alpha Arbutin 2% + HA accelerates this process resulting in a clearer, healthier looking complexion. Despite reducing my make-up from a filing cabinet drawer to a single beauty bag; I’m still working through a bunch of items I didn’t have the heart to get rid of during my last declutter. I’m clinging onto a few pieces I don’t love but I do like. 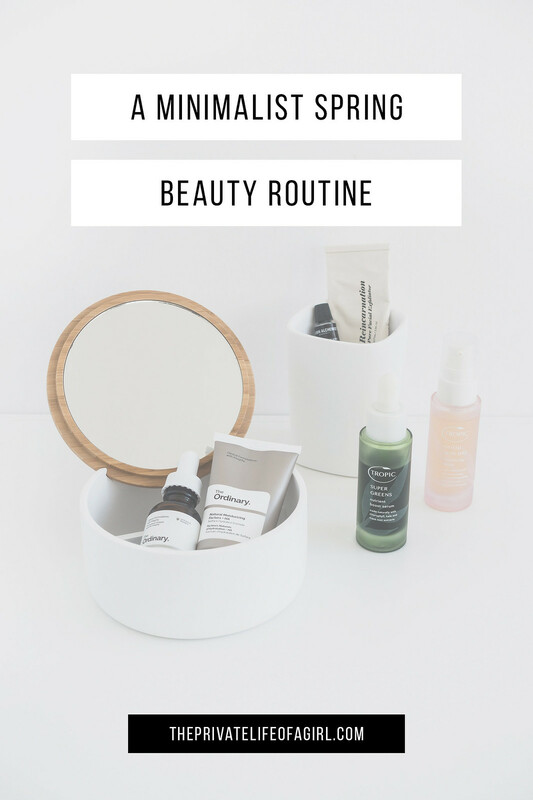 Although I typically reach for the same handful of products every day, I want to use everything up to avoid waste. I recently added a set of Iconic London Face Brushes to my routine. The Zoeva Vegan Prime Set is fantastic but it was missing a few face brushes. The Iconic London set contains 9 cruelty-free brushes designed to apply powder, cream, and liquid formulas. They’re well-made and have a weighty feel so application feels controlled; the result is a soft and natural finish. Aside from the very rare occasion, I skip foundation altogether now and instead apply a little primer to smooth over my complexion. I’ve been using The Ordinary High-Spreadability Fluid Primer and The Ordinary High-Adherence Silicone Primer both of which I highly recommend. Lightweight, easy to apply, and comfortable on the skin; they fill fine lines and even out of the texture of your skin prepping it for make-up. To cover dark circles or imperfections, I’ll use the Shiseido Concealer Stick in 11, which is the perfect match for pale skin tones. It’s thick and creamy yet blends beautifully especially if you use a Beauty Blender, and it looks flawless all day. I’ve really been into ‘no make-up’ make-up lately; quick to apply and effortless to wear, I focus on using as few products as possible. After applying a primer I’ll brush through my brows and add a little Homeoplasmine to keep them in check; occasionally I’ll fill them with a Kiko Eyebrow Sculpt Pencil. I’ll sweep Lily Lolo Buttered Up eye shadow over my eyes, or the shimmery shade from the Tropic Skincare Brown Eyed Girl palette, and line them with a dark brown eye shadow. To finish, I add a sweep of Shiseido Perfect Mascara Full Definition. Since quitting foundation I’ve fallen in love with cream/liquid blushes. I find them blend flawlessly into naked skin and look far more natural. I’m on the hunt for a vegan-friendly liquid blush (any recommendations?) but right now I’m using up a bottle of Perricone MD No Blush Blush, which gives a natural flush of colour and looks beautiful on the skin. With such a pale complexion I find I need a dab of highlighter - I use the Tropic Skincare Spotlight Cream Highlighter - to brighten and illuminate. The dewy glow it creates enhances the fresh natural face of ‘no make-up’ make-up. I have a small selection of lipsticks and tints to choose from, which I’m working my way through and won’t be replacing. I rarely wear any lip products and although it’s nice to have the choice, I’ve realised I only really need one option. Mostly I just apply Homeoplasmine lip salve but if I want to add a little colour I’ll reach for Tropic Skincare Rosehip Lipstick - a soft red berry shade - or Fresh Honey Tinted Balm for a soft, easy-to-wear tint.